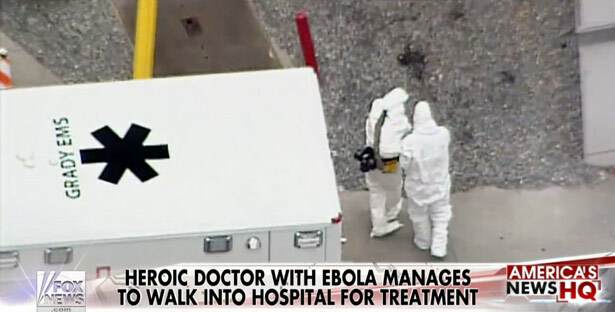 What’s Behind the Media’s Ebola Sensationalism? Ebola is a symbol to the political right of all the Third World horrors that liberals are inviting past the walls of our city on the hill. 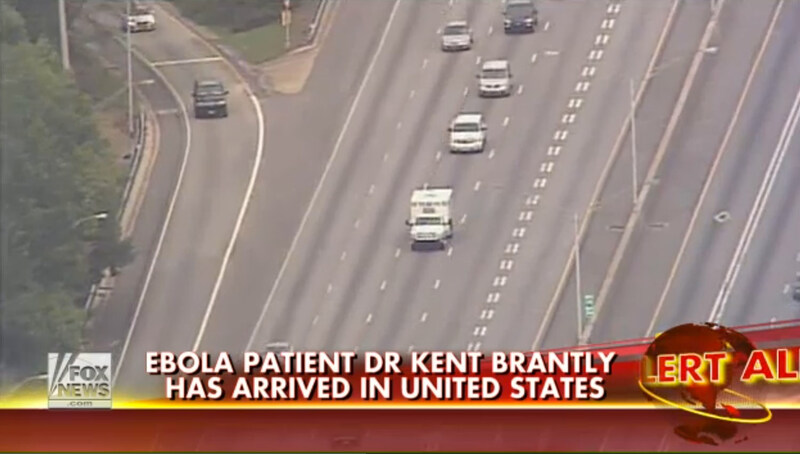 CNN, Fox News and MSNBC all treated the return of Kent Brantly, the American doctor who contracted Ebola in Liberia, as if he were riding to the hospital in a white Ford Bronco. Chopper cams and speculative commentary trailed his ambulance Saturday through the streets of Atlanta with the kind of excited intensity usually reserved for police car chases and killers on the lam. In the end, the breathless live coverage was revealed to be embarrassingly over-the-top: Brantly didn’t even need a stretcher; he climbed out of the parked ambulance in a hazmat suit and walked, with the support of just one person, into a back door of Emory University Hospital. That was the tip-off that giving a disease the O.J. treatment is a symptom of a media sickness for which there appears to be no cure. Ebola is a terrible hemorrhagic fever that can kill from 50 percent to 90 percent of those who contract it. It’s also a symbol to the political right of all the Third World horrors that liberals are inviting past the walls of our City on the Hill. But now that two American aid workers—Nancy Writebol has just arrived at Emory, on a stretcher but, so far, with less fanfare—have brought it directly to our shores, it’s a Clear and Present Danger. Georgia congressman Phil Gingrey went so far last month as to warn that the Central American children who’ve been turning up at border stations around the country might be smuggling Ebola in with them, like so many contagious Trojan horses (even though Ebola fever has never been detected in a patient outside of Africa). Howlers like Gingrey’s—echoed Monday by Representative Todd Rokita (R-IN)—work because Ebola, “diseased” immigrants, and “blood pollution” of all sorts fit neatly into the racist subtext of the radical right’s opposition to Obama. After all, our “lawless,” African-born POTUS, whose parents faked a birth certificate fifty-three years ago this week in order to infect America with socialism today, just happens to be hosting fifty-one African nations at a summit in Washington. How much proof do you need? Various studies have shown that conservatives have a lower threshold for disgust than liberals do, and Ebola, which is spread through direct contact with bodily fluids (like vomit, feces and blood, but not through sneezing or coughing) certainly crosses that low bar. Nor is it lost on wingers that AIDS originated in Africa, too. But many of the diseases that humans are heir to are pretty damn disgusting, no matter where they originate. There aren’t two tiers of diseases any more than there are two tiers of humanity. And never mind that fighting such viruses at their place of origin is far more effective than pretending there’s a disinfectant force-field around the Homeland. Brantly is reported to have been suffering the consequences of doing good with a vengeance until he received two emergency treatments: an experimental serum developed by a San Diego pharmaceutical company, and, according to Samaritan’s Purse, the relief organization working with Brantly, a blood transfusion from a 14-year-old boy who survived the disease after Brantly cared for him in Liberia. Guess which treatment gets more coverage on American TV? Which brings us back to the fever the media has been suffering ever since the ascent of the Tea Party. Rather than dispel unscientific and political myths, the instinct at many news outlets has been to promote them. The scientific truth the media should have been promoting all along isn’t that Ebola is a Holy Terror emerging from “other” races and immune to Western treatment; rather, it’s a horrible illness with a terrifically high kill rate because up to now it has appeared only in Africa, where clean water, enforced quarantines and disposable medical supplies are hard to come by. That the first take played on cable news channels, regardless of their political leanings, is a measure of just how deeply the right-wing anti-science message has taken hold on TV. But by sheer accident, the car-chase media did the public a service, demonstrating, as Brantly walked into the hospital, that the existential danger over Ebola is being oversold. MSNBC anchor Alex Witt asked on-air physicians, including NBC in-house doctor Nancy Snyderman, if they would be afraid to treat Brantly. No, said Snyderman. Any doctor would be “excited” by the opportunity to use the medical precautions and equipment available in America to find effective treatments for the disease without spreading it.